« Scared of open mic nights in South Jersey? 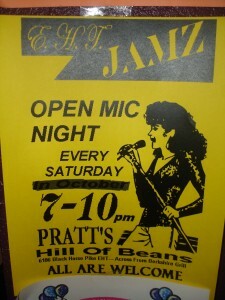 EHT Jamz at Pratt’s Hill of Beans is held every Saturday starting at 7pm. “Pratt’s” is located on 6106 Black Horse Pike, Unit B-4. Adam Shaber and his dad Matt host EHT Jamz at Pratt’s, which is also the home of Alternative Soul. As always, you can grab good coffee and teas from around the world. EHT Jamz ends at 10pm and as the poster says, “All are welcome”. Bring a friend with you and you both can get up and perform thanks to the available PA system. 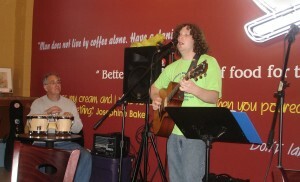 EHT Jamz is an overall good night for musicians and poets that allows for lots of socializing. This could very well be where the next young band forms. This entry was posted on May 3, 2009, 2:43 pm and is filed under Reviews of Open Mics. You can follow any responses to this entry through RSS 2.0. You can leave a response, or trackback from your own site.